Short, intense workouts are all the rage in the fitness world. While it was once believed that the longer you stayed on the treadmill or elliptical machine, the better, it's now known that you can seriously maximize your fitness results while working out for a fraction of the time, as long as you sufficiently ramp up the intensity (interspersed with periods of rest). Very short workouts, as in seven minutes or even less, are also becoming regulars in the fitness scene, although I would stop short of calling them a trend. The fact is, humans have been exercising in very short, intense bursts since the beginning, although they didn't call it exercise; they called it survival. Brett Klika, a performance coach for the Human Performance Institute (HPI) in Orlando, Florida, and Chris Jordan, the director of exercise physiology at the HPI, conducted a study to determine the health benefits of high-intensity circuit training (HICT), which for their study used only body weight as resistance. Notably, they work with professionals and athletes with "incessant demands on their time," many of whom also travel frequently. They pointed out that typically aerobic and resistance training are performed on two or three nonconsecutive days each week. "Our approach combines aerobic and resistance training into a single exercise bout lasting approximately [seven] minutes. Participants can repeat the [seven]-minute bout two to three times, depending on the amount of time they have. HICT is not a new concept, but it is growing in popularity because of its efficiency and practicality for a time-constrained society. The combination of aerobic and resistance training in a high-intensity, limited-rest design can deliver numerous health benefits in much less time than traditional programs." You can watch a demonstration of the exercise sequence in the video above, and they're also described below. Each exercise is performed for about 30 seconds with 10-seconds allowed for transitions. 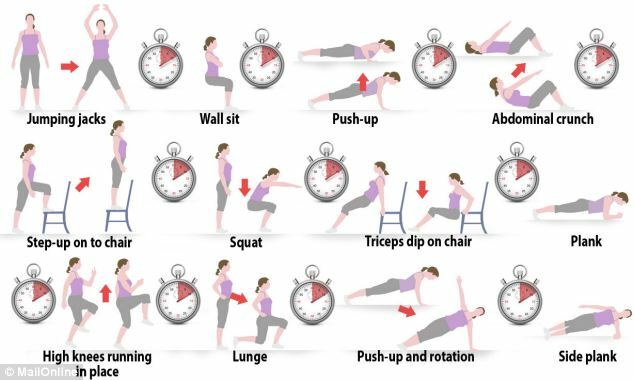 This adds up to an approximately seven-minute workout, which may be repeated in its entirety two or three times. The exercises should be done in the order given, as they're selected to allow opposing muscle groups to alternate between resting and working. The good thing about HIIT is that you can tweak it to your needs. You can still get benefits from working out at a slightly lower intensity; you simply increase the time you work out to make up for it. You'll still be working out very intensely, remember, so your total workout will still be short, relatively speaking. "More moderate protocols (90 [percent] to 100 [percent] of VO2 max) have been examined for various total exercise durations. Although these protocols seem to require slightly more total exercise time to be effective, they still are well below the steady state exercise time requirements. Because most individuals may not be able to execute the program at an intensity significantly greater than 100 [percent] of their VO2 max following the established ACSM guidelines for high-intensity exercise of at least 20 minutes is recommended. This may require multiple repetitions (or circuits) of a multistation exercise circuit." Lack of time is one of the most common excuses used for not exercising. HIIT removes this hurdle, because virtually everyone can squeeze in seven minutes. If you have a bit more time, and you're performing the workout at less than 100 percent, try repeating it two or three times. Previous Article Can Exercise Prevent Hearing Loss? Next Article Have You Heard of Aerial Yoga?